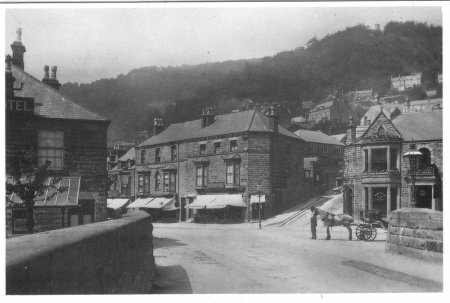 Taken c1895 from the station. On the left of the bridge over the Derwent is the Midland Hotel, on the right the Station Hotel. In the foreground are some tarpaulined railway trucks. The tower is on the Heights of Abraham. This is a view from Matlock Bath station towards the Heights of Abraham. Out of sight behind the picket fence are the River Derwent and North Parade! 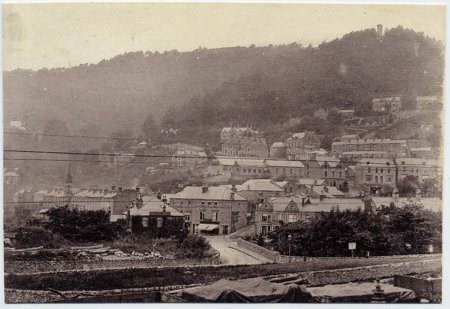 The view looks up Holme Road, with the houses of Hope Terrace on the right. Fixed to the fence are adverts for: The Glasgow Herald, Earle's Cement, Crossway's Gas & Oil Engines, Melrose whisky, The People and Bryant and May matches. Its a long way from Glasgow, perhaps many Scots found their way to Matlock Bath and the Hydros in Matlock just up the road, to "take the waters". 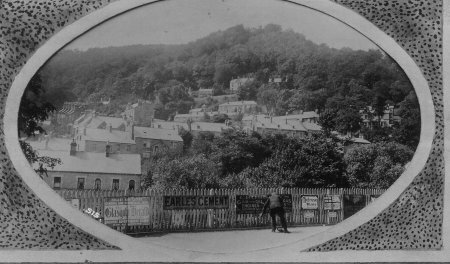 Taken 1892, North Parade, Matlock Bath.